For a few months now I have wanted to do the moss ball salad greens thing. If you don’t know what I’m talking about, it’s all the rage. Check out this video! A couple weeks ago we went to our local nursery to see if they had the moss spheres in stock. What we discovered was even better. As we walked around looking at all the plants, I noticed an event flyer and gave it a once over. Lo and behold they were going to have a class on edible gardens the following week! My husband and I got really excited and decided we would attend the class. So a week went by and we went to the class. We learned so much! The gardening expert talked about fertilizing and watering, and all sorts of tips and tricks to aid us in our gardening adventure. After the lesson, we got started. We picked out our plants, and followed along as the leader walked us through what to do. Between the two of us, we ended up making three hanging baskets. 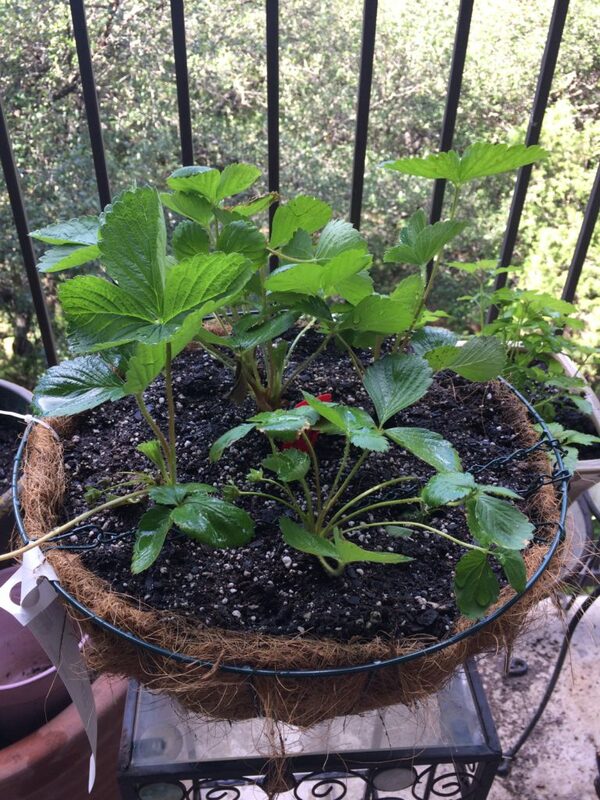 Here in South Texas we have two growing seasons, so one of our baskets we filled with Strawberry plants that we will harvest in the Springtime. The other two we filled with salad greens and common herbs we use in the kitchen. Once they fill out, we can just snip off the bit of salad we need, and set it on the dinner table. Pretty cool, huh? I really want to cut down on our groceries in this respect, not to mention waste. Oftentimes, I will buy a bag of salad greens and won’t be able to get through it before it spoils (usually because I am the only one eating them). 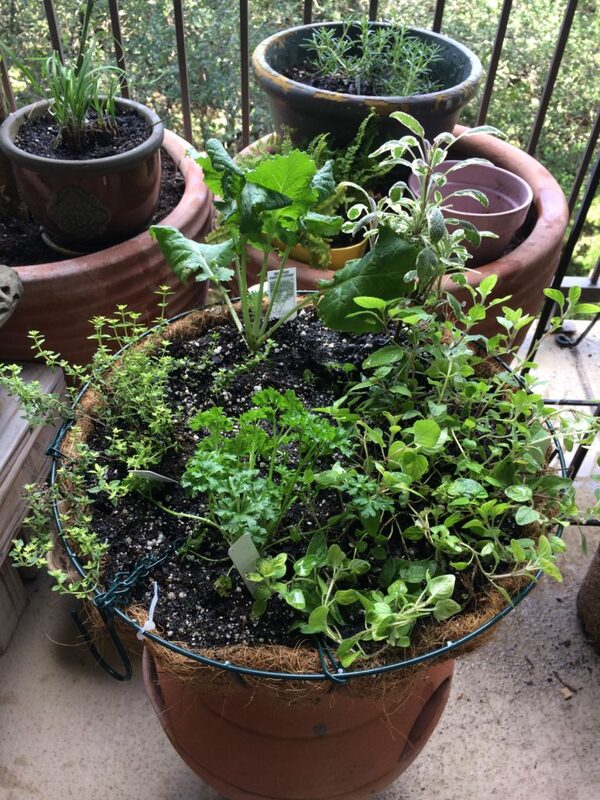 When we lived in our house, we were able to plant some different greens and lots of herbs, but we had to say goodbye to many of the things we planted when we moved into our apartment. So we finished our baskets, paid for them, then headed home to set them up on our patio. My husband and I were chatting about this and that, very excited to get to garden again. 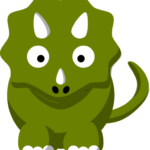 Then I heard a gagging sound and turned in horror to see my son vomit up a mixture of milk and…you guessed it! Dirt. Once I ascertained that he was ok and we didn’t need to pull the car over, I had to laugh. He was still reaching out to grab at the planter we had set next to him on the seat. He still had a fist-full of dirt and was trying to shovel it into his mouth. He had completely uprooted a strawberry plant, so while turned awkwardly in my seat, I replanted it as best as I could, then played referee between my son and the planter, as he kept finding gaps to grab at the dirt. Naturally when we got home, we had a certain amount of cleaning up to do, but our joy was not quashed by my son’s little mishap. We were all three in good spirits and still very much looking forward to replanting some of the plants we had salvaged from our home and care for our new edible garden. We stuck a pair of sweatpants on my son, so that his knees wouldn’t get scraped up on the concrete from the patio, then let him loose. He had a blast! Forgive the juvenile adage, but…it was the best day ever! We had several pots that just had dirt with nothing planted in them. We decided to dump all this soil into our largest pot and start with fresh soil and replant a few of the edibles we’d had for a while. As we did this, my son stood over a pot and proceeded to take dirt by the handful and simply throw it on the ground. Every now and again he would pause to “taste” something he had found. At one point I had to fish around in his mouth, where I recovered two small rocks he was storing in his little cheeks like a chipmunk! He was a crack up! He even grabbed a spade we had left near him and dug around in the dirt with it. I wish I could relate the joy both my husband and I experienced watching our son enjoying the outdoors and quite literally playing in the dirt! He even chased a little spider around for a while. For us, it was a glimpse of what’s to come. We are really working towards the goal of owning some property and having a small farm one day. We really want that for our son, as we both experienced our grandparents’ farms as children. It truly was such an awesome day! 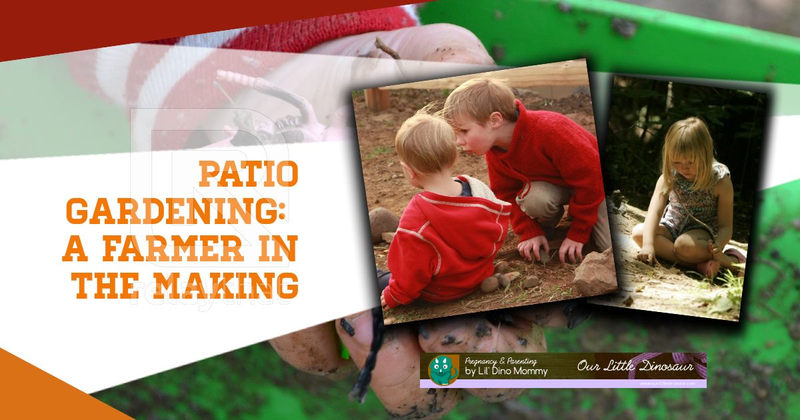 But for now, my husband and I make plans (read our story here on my husband’s blog), while my son and I go out every morning after breakfast and care for our little patio garden and do the watering. He absolutely loves it and it’s such a pleasant time to spend together. I know, I know, they aren’t hanging. Turns out the arch of our apartment patio is concrete, so we are still brainstorming how to make these hang. In the meantime, they are still lovely to look at on plant stands. Also keep in mind they will fill in A LOT, so look for a future post about how they turn out! 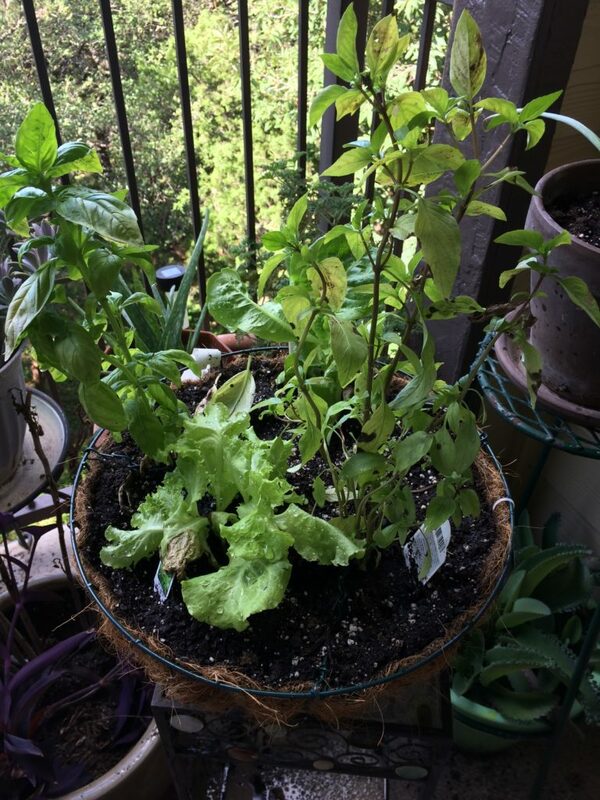 This planter contains two types of lettuce, as well as two types of Basil. We are especially excited about the Cinnamon Basil, which we intend to test out in drinks, such as tea and maybe even as a flavoring in water. The Basil will die off this winter, so we’ll harvest what we can and dry the leaves and store. This basket contains Kale and what I like to call, savory herbs, such as Oregano, Parsley, Sage, and Thyme. Hmm…seems like we’re missing one… Don’t worry, the Rosemary is in it’s own pot. It’s a little too aggressive to plant in with the others. I can’t wait to harvest these strawberries in the spring and can our all-fruit jam! Did you know that the strawberry leaves can be used to help with stomach ache? What hobbies do you enjoy? What experiences do you really want your children to have? We really want to know!